Made from blended mustard seed and spices, this mustard sauce is yellow in colour and hot in taste. 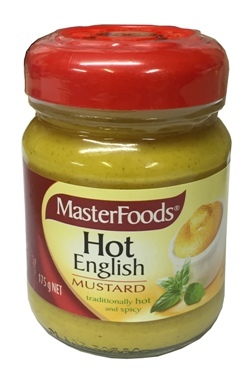 Masterfoods Hot English Mustard goes well with roast beef and corned beef, or try adding it to sauces to serve with oily fish such as mackerel or mullet. Water, Mustard Seed (16%), Salt, Vegetable Shortening, Spices, Acidity Regulator (Citric Acid), Soy Lecithin, Colour (E160a), Spice Extracts. Had this fiery mustard in QLD and was so good brought 2 jars home which sadly have now gone,but ordered and received 4 more so back to best mustard in the world and a very happy memory of my time in Oz. This is the best "Hot English" mustard you will ever tasted in your life. Seems strange to get an Australian version of Hot English Mustard in the UK. I've been addicted to this stuff since i was a lad and the english versions just don't cut it. Dollop it on ya ham sandie, steak, roast pork to stimulate your senses and clear your sinuses at the same time. If you like the burning sensation and Heat of wasabi paste you will love this. Can't get a better mustard with steak in the world!! !